Dressing for work on Valentine’s day can be a bit difficult to get the balance right. You want to look professional, appropriate for the job you do but also going with the theme of the day. I love to express myself with colour. It is the easiest way to look professional but also be current. Choose a pink that works for you and your work environment the best. 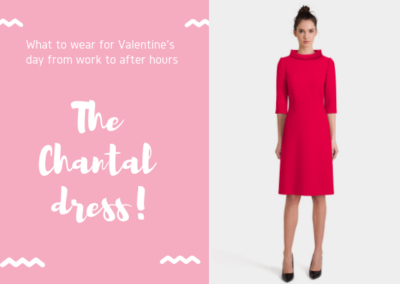 Like our Chantal dress in raspberry pink. PREVIOUS: Do you have this in Pink? Get ready for Valentine’s Day! NEXT: REINVENT YOUR STYLE WITH COLOUR! Posted on Sunday, February 3rd, 2019 at 5:52 pm in Looks, News. You can follow any responses to this entry through the RSS 2.0 feed. Both comments and pings are currently closed.